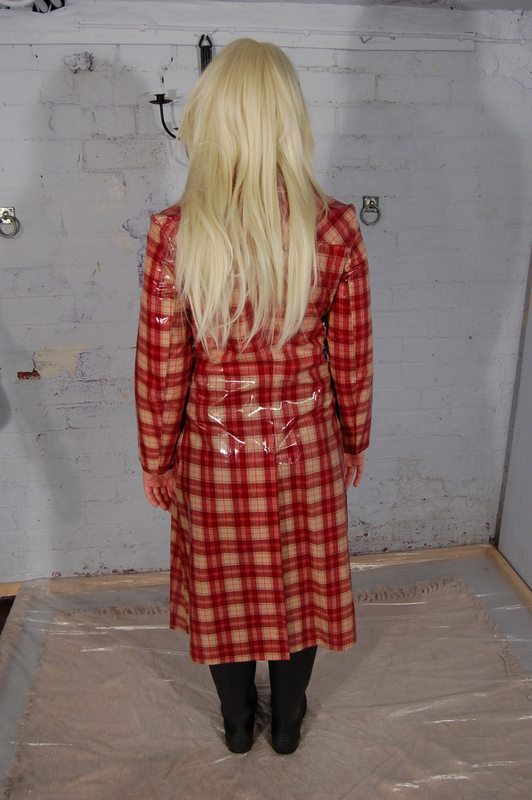 PVC Coat Pieing - Prudence puts some classic rainwear to the custard pie test! Prudence puts some classic rainwear to the custard pie test! Meet Prudence, Lady Jasmine's housekeeper. She likes to get hands on with her work, so when the opportunity arrives to gunge-test a classic 1970s heavy PVC raincoat with pies and custard, she enthusiastically volunteers to be the victim, with the pies and gunge to be delivered by Chastity, our gunge-wild head gardener. Prudence dresses in a totally 70s style for the session, putting on classic blue jeans and a white poloneck jumper, with black wellies for her feet, before neatly closing the press-studs of her lovely red tartan double-breasted rain coat. And then she meekly stands in the dungeon, and takes her pies like a woman, a Saturation Hall woman that is, enjoying every moment as more mess is splattered and mashed onto her coat. She takes several pies to her front, delivered full force and with splashes of filling splattering under her chin with each hit, then she turns and takes more pies on her back and down one arm. Custard sitting is next, Chastity prepares one of our trademark silver trays full of custard, adding some broken flan base remains for good measure, and Prudence obediently sits down in the mess, coating the seat of the PVC coat in more custard. She initially sits facing away from us so we can watch her lowering her bottom into the gunge, then stands up to show off the damage, before coming round to the front and sitting down again, the better for Chastity to pour lots of custard over her shoulders and down her front, from where it collects in a pool in her lap. She makes no effort to protect her long blonde hair during any of this, so while the coat is so far protecting her jeans and jumper from the steadily increasing mess, her hair starts to get quite messy too. Eventually, she stands up again, shows off how messy the coat has become, and then opens it to reveal her completely clean jeans and jumper beneath. Clearly this isn't a good state of afairs for one of ous household, so she calmly allows Chastity to repeat most of the earlier pieings, just to show what would have happened to her outfit had she not been wearing the coat. She takes a large flan to the chest, a smaller one to the trunk of her jeans, and then Chastity sets about her hair, twin pies applied at the back and then lots of custard poured over her. The tray is refilled, and Prudence takes a seat again, this time plunging the bum of her unprotected jeans straight into the thick yellow gloop, before standng up so we can see the results. Eventually, she lays the coat down on the floor, pours and walks gunge all over the inside, and then puts it back on over her gunge-drenched clothes, posing to show her very messy self off before retiring to be hosed down, still dressed in mess-drenched clothes. The last 37 photos show the hosedown.